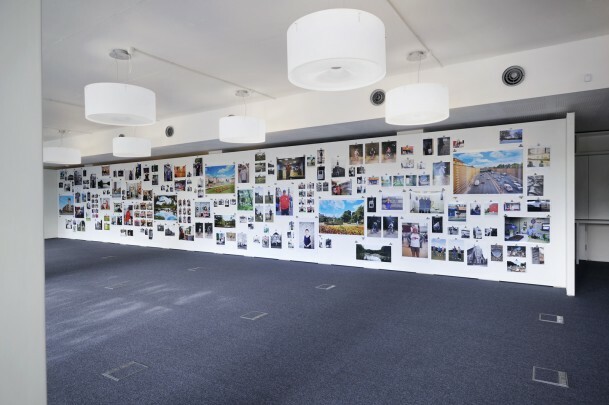 In 2010 12 artists and photographers collaborated to document the rich tapestry of life in theLondon borough of WalthamForest and displayed the work in a single 15 metre long installation in response to Grayson Perry’s Walthamstow Tapestry and as part of the annual E17 Art Trail this September. The exhibition aims to create a photographic tableau depicting life inWalthamForest, one of London’s outlying Olympic Boroughs. By working in collaboration with each other, the artists are challenging the way they work, the nature of ownership and collective responsibility within the local community. Each artist’s work is interspersed with each other’s, spread out and displayed as part of a single group installation over 15 metres in length. The exhibitions was displayed in an empty open-plan office space in Tower Mews, in the centre of Walthamstow.